Home » Outdoors » Gardening » Let Your Garden Grow! There’s really nothing better than fresh vegetables. Except for when you grow them yourself. 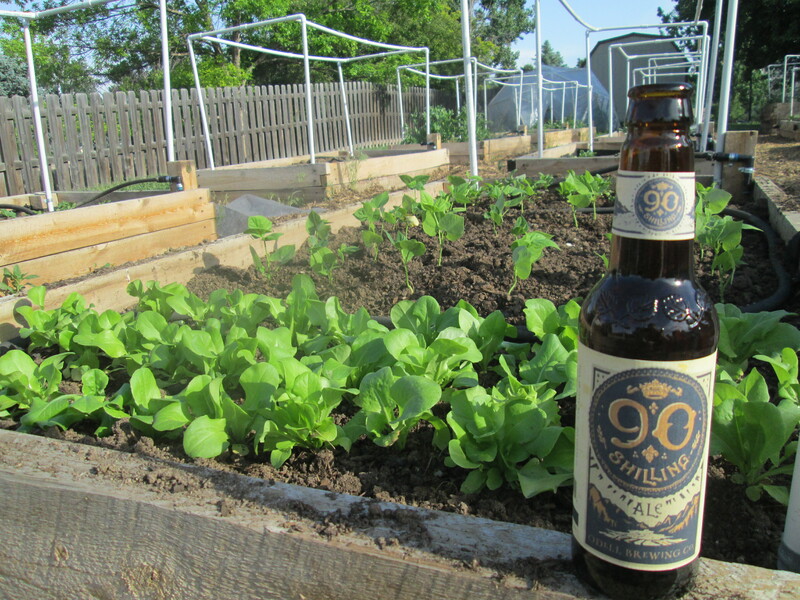 That extra little touch of TLC and knowing exactly where your food came from makes gardening such a rewarding hobby. I can say that, because as of, well, two days ago, I am a self-proclaimed organic gardener; I’m going to go ahead and add that to my repertoire, and I have the blisters to prove it. I am so excited for the first season of growing my own food and learning what all goes in to it. 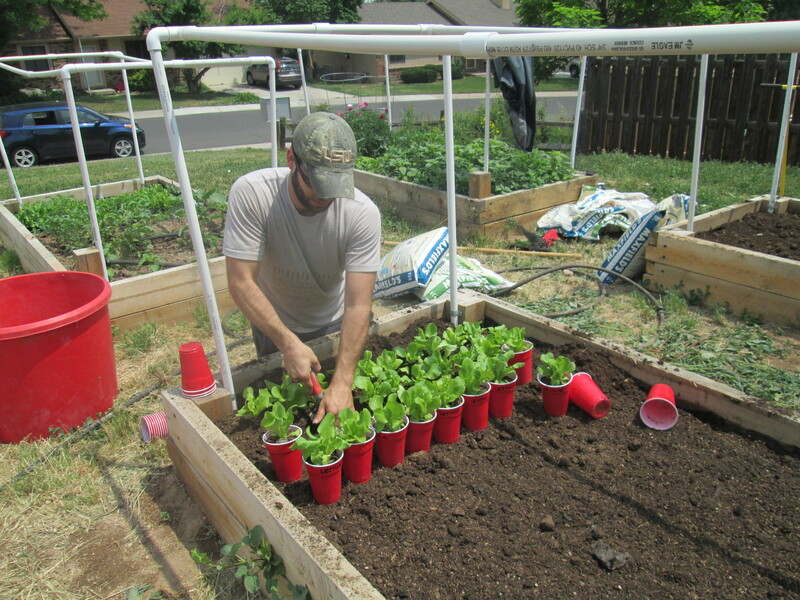 Aaron and I decided we wanted to grow our own fresh vegetables this year, and, while he has done this many many many times before, this was really my first time gardening outside of simply watering flowers. Needless to say, I didn’t really know what to do. We started with seeds and germination stations. Lots and lots and lots of them. 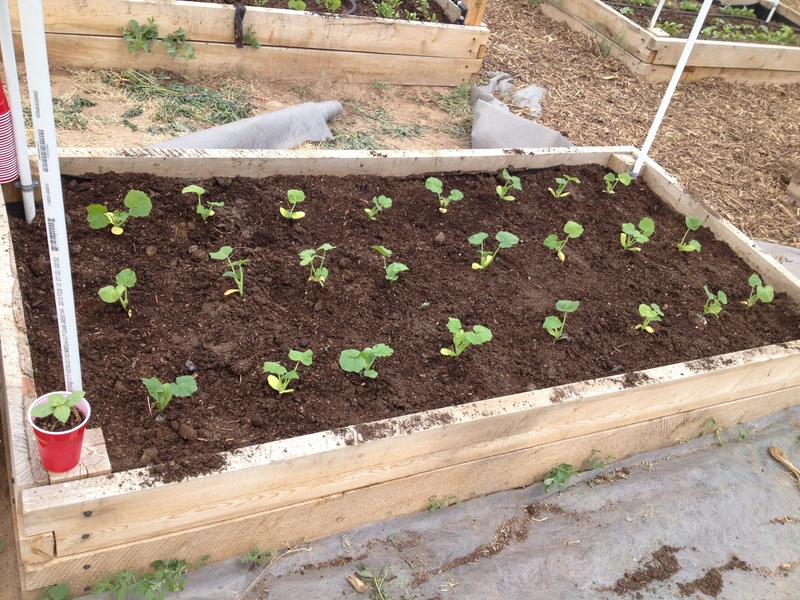 Leaf lettuce, spinach, kale, green onion, yellow squash, cucumbers, arugula, beans, peas, zucchini, peppers, and carrots. Keeping everything organic was, and is, really important to us, and we have succeeded so far, even from the seedling and germination process. We wanted no synthetics. The reality is, it doesn’t get very exciting…until you see that first tiny little green sprout – that’s when it gets real. It’s the first miniature ‘hello’ from what will be your dinner a few months down the road. Once they got big enough, we transferred them into solo cups – yes they can be used for more than just adult frothy beverages. 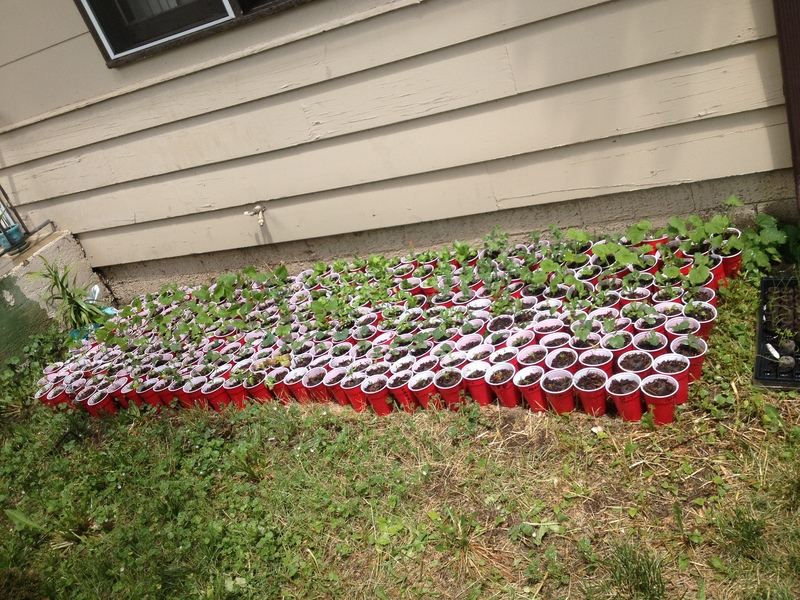 We put a slit in the bottom of each cup for drainage and then potted each plant individually into them. Our original labels got a little jumbled in the germination stations, so we guestimated what a few of the plants were and labeled each solo cup. Needless to say our ‘carrots’ were definitely not carrots, but peppers (which was a pleasant surprise because we thought that they had all died out). Unfortunately, the kale and spinach decided vegetable heaven was a better alternative for them. 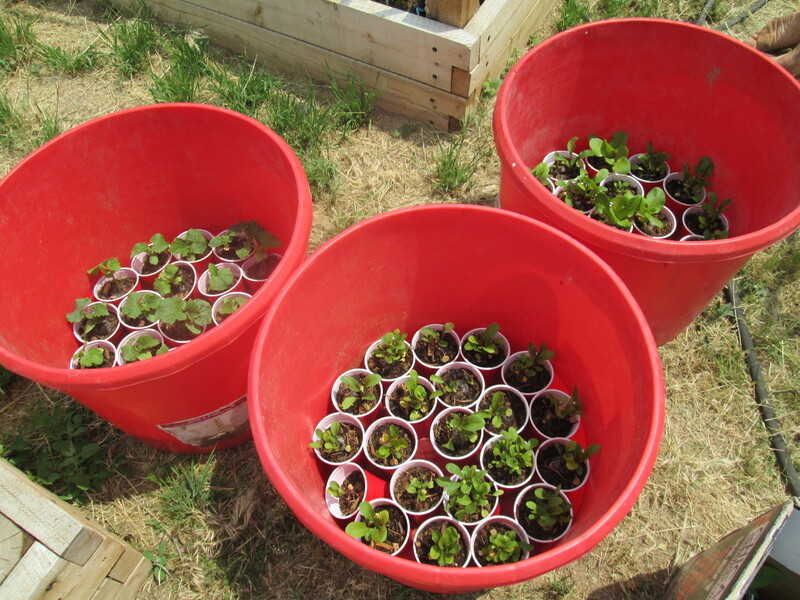 The plants can actually stay in these cups for a long time, which made it nice until we could find a home for them. We got extremely lucky and were able to reserve some brand new community garden beds for the season. We originally ‘rented’ two of them, but quickly got our hands on two more, as we have a ton of plants. 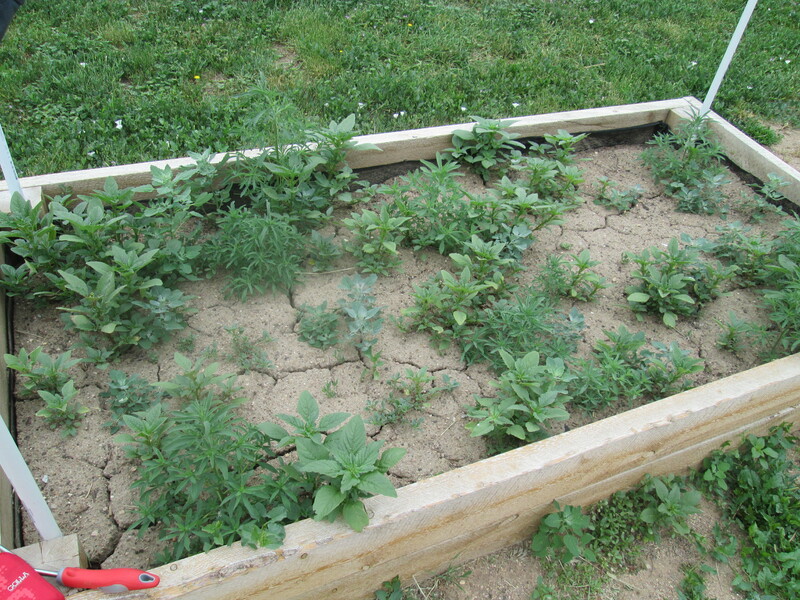 When we showed up, the beds were all dried out and weeded over. And that’s when the work begins. Within minutes we had broken the rake that we brought with us. Thank goodness for Home Depot. 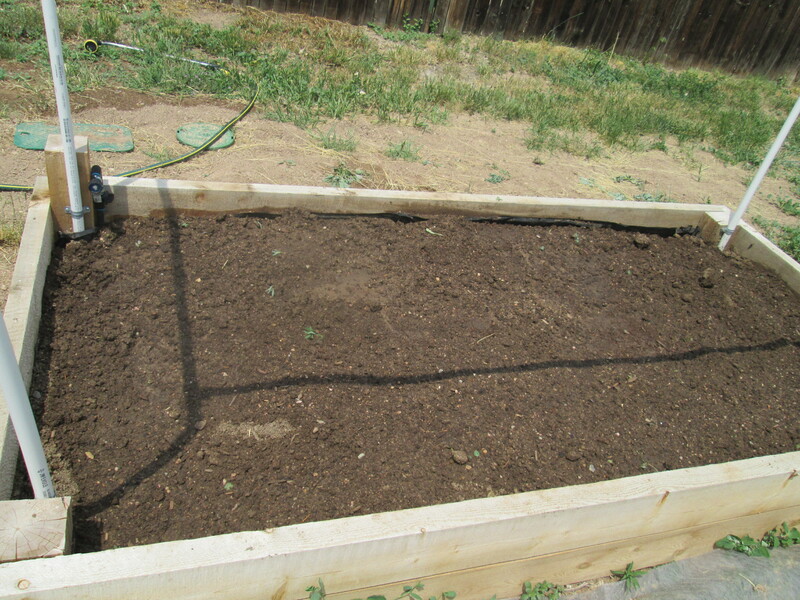 After soaking all the beds, we were finally able to pull the weeds and till the soil. 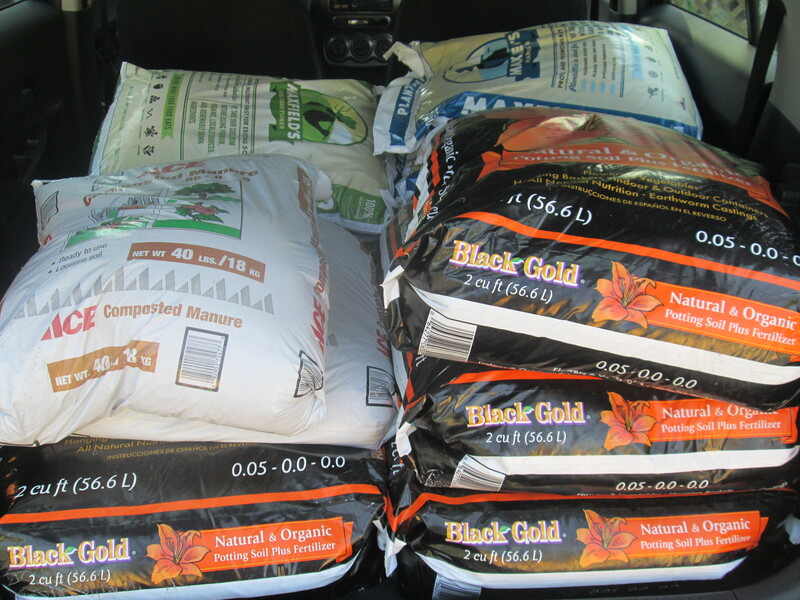 To supplement the soil provided, we used Maxfield’s Organic Soil Conditioner, Maxfield’s Organic Planting Mix, and some composted manure. I bought these all at Ace Hardware. Delish. Let me tell you, hand-tilling compacted soil is HARD. After all the beds had beautifully tilled soil and supplements, thanks to yours truly, it was time to start the planting. 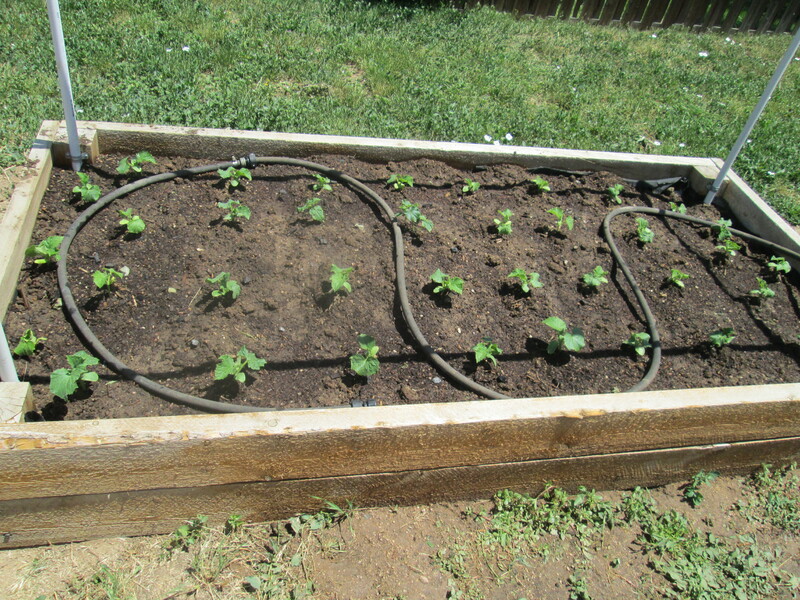 One bed we dedicated strictly to cucumbers, because we have so many plants. We want to make our own pickles with them, too. For brine: combine 3 cups water with 2-3 tbs of kosher salt, 6 tbs of white vinegar, stir until dissolved. Cut 2-3 full size cucumbers in slices or spears. Layer cucumbers in a dish or bowl (Corningware works well) with sprigs of fresh dill. Pour brine over cucumbers and grate 1-2 cloves of garlic on top. Cover and refrigerate 2 days before eating. 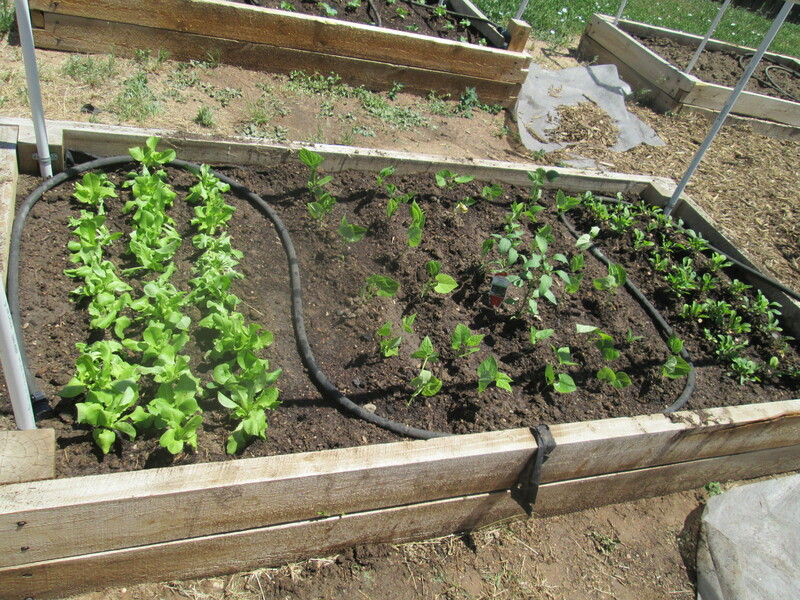 One bed has lettuce, beans, and arugula. Lettuce on left. Beans in middle. Arugula on right. 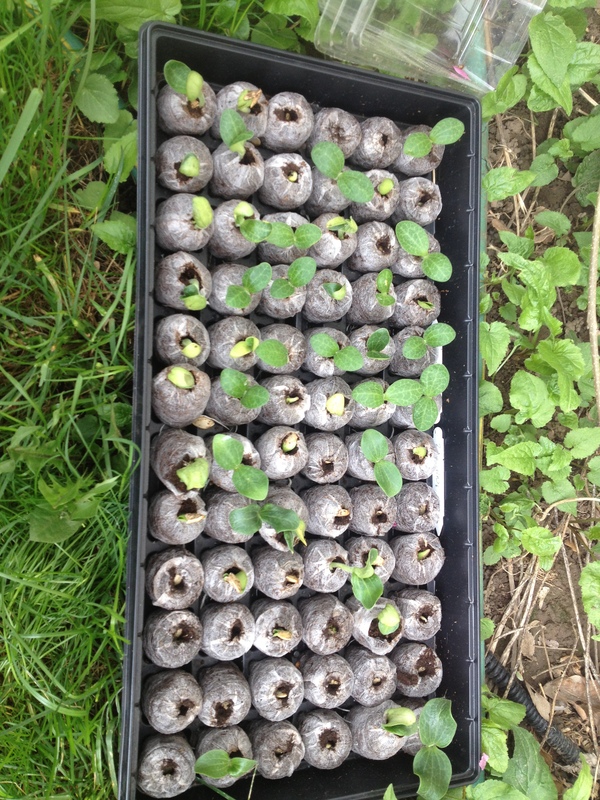 One for yellow squash, since the plants will get large. And one for zucchini and peppers. Zucchini on the outside. Peppers in the middle. 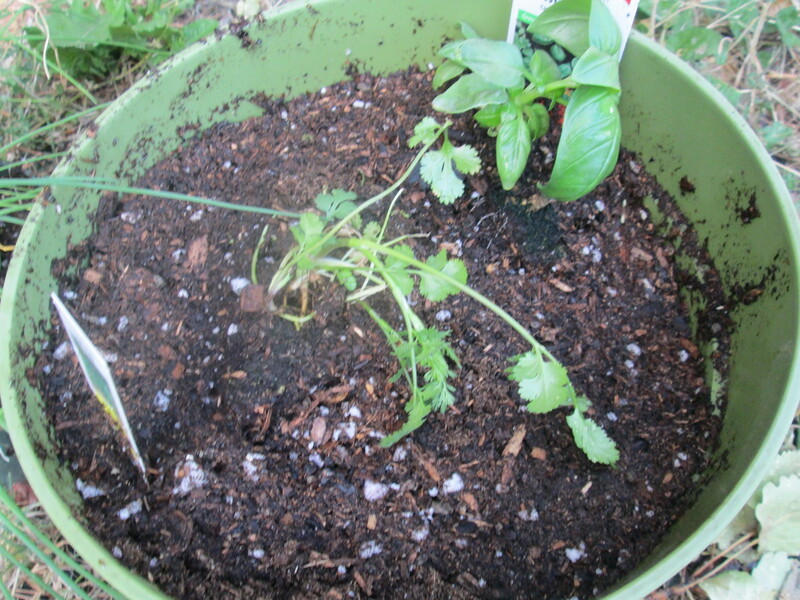 Obviously we still have several plants left and will be planting them in large planter buckets. And probably giving the rest away that we just don’t have room for. After hours and hours of gardening and planting 177 vegetable plants (yes, I counted), instead of getting bored or tired, I got the urge and desire to plant EVERYTHING! So I went out and got some broccoli plants, a yellow pear tomato plant, and the last cilantro and basil plant that the nursery had. 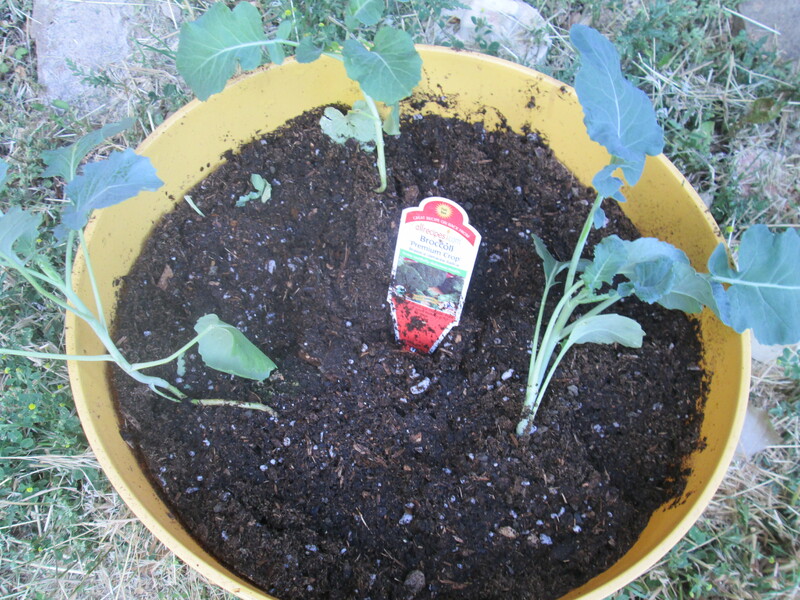 For potting soil, I used BlackGold Organic Potting Soil. I’ve turned into a planting fiend! It’s addicting! I had to make myself stop and call it a day. The hard part is done. 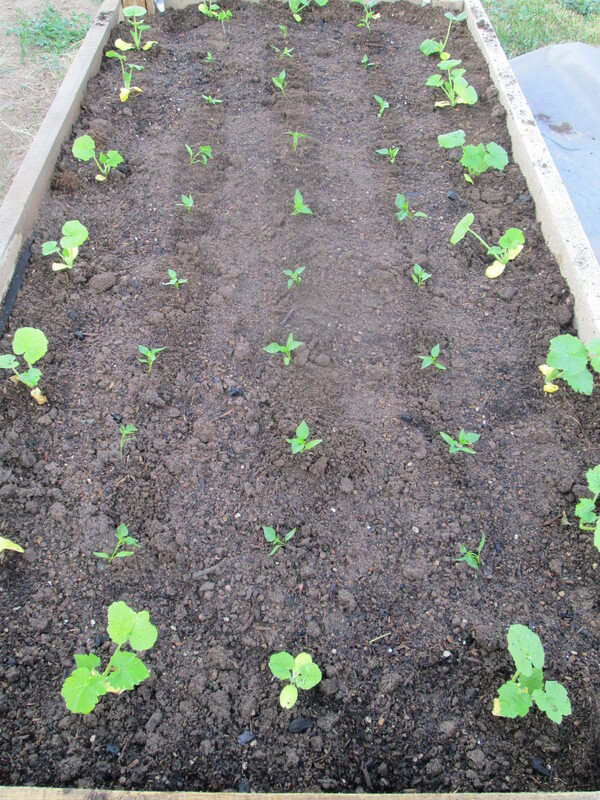 Creating a home for the vegetables was more rewarding than I thought it was going to be and was very successful. I think I’ve found my new favorite hobby. I can’t wait to watch our garden grow! Do you have a garden? 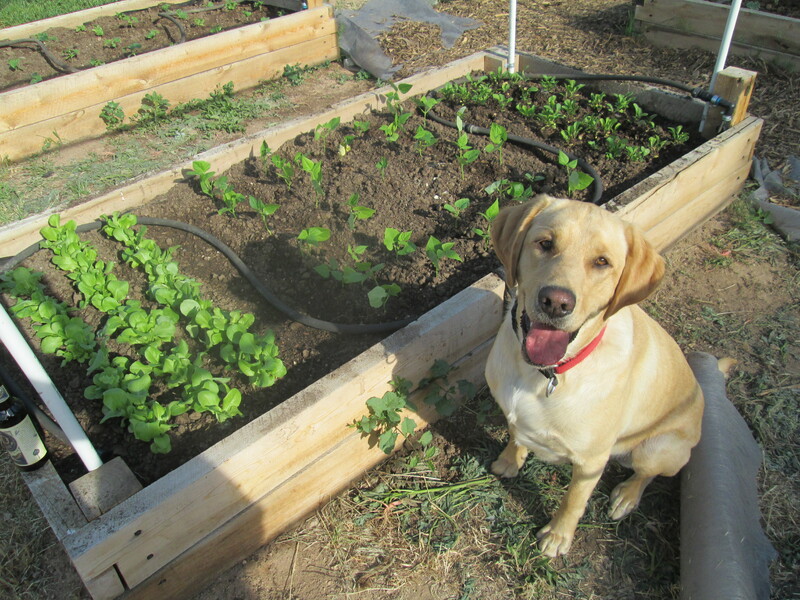 What’s your favorite vegetable to plant? 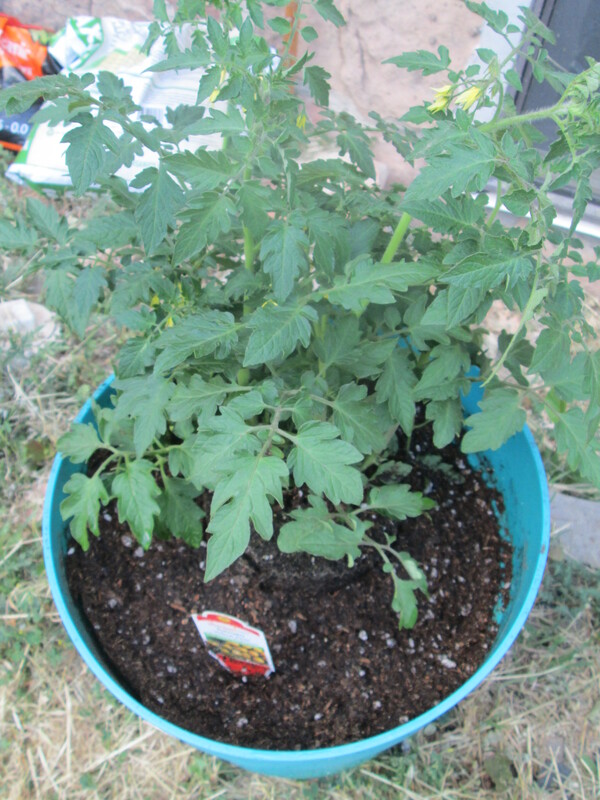 This entry was posted in Gardening, Outdoors, Recipes and tagged adventure, challenge, gardening, new experiences, outdoors, recipes. Bookmark the permalink. If I had to choose a “favorite” vegetable to plant it would probably be amaranth: the variety I grow grows very tall (10′) and has big magenta seed heads, it is just so unique and pretty. 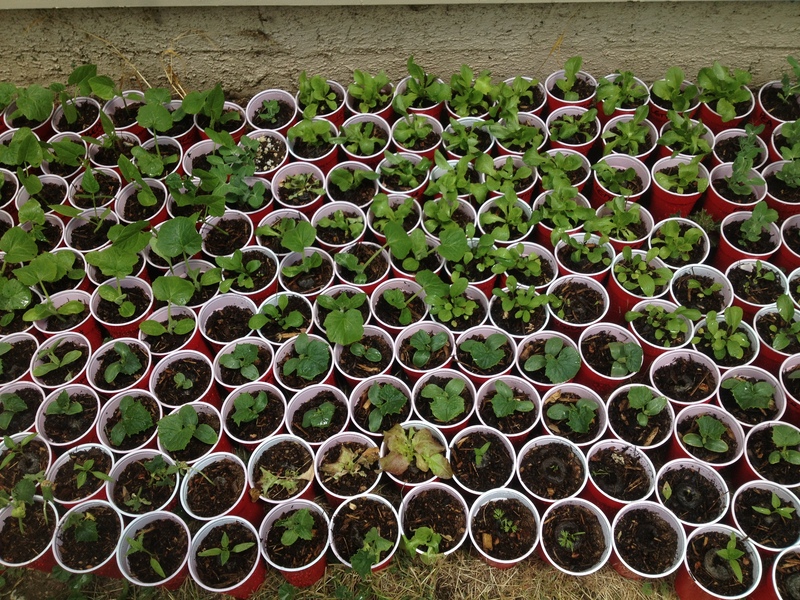 I love your pictures of all the seedlings together in the red cups! That was an awesome post. Just remember, you don’t have to start everything in pots. Beans are best planted in the ground. I don’t think I have ever heard of anyone starting them in pots, so I was kind of shocked!